Priest is the critically acclaimed manhwa (Korean manga) about a fallen priest who sold half his soul to a devil in order to be resurrected with the power to get revenge upon another demonic being, and correct a grave evil he unknowingly committed. While I’m not a fan of manga, anime, and never even knew that there was a special name for the Korean brand of manga called manhwa, I did notice that there was a movie based on this work being made. The film, which stars Paul Bettany (Legion, Angels and Demons) in the titular role, while having a great deal of potential, performed poorly at the box office, with critics, and with most comic book fans. The film’s not having much in common with the original manhwa didn’t help. There were some similarities between the two though, mostly an action sequence with a train of evil monsters on their way to destroy a city, but the setting, premise, and theme of the two works are distinctly different in nearly every way. It seemed that the film tried to find its way amongst while attempting to join the pack of overexposed vampire apocalypse films and on its way ended up losing its soul. Hopefully though, the film will inspire its viewers to pick up the collected first three volumes of the original manhwa titled Priest: Genesis. It inspired me to pick it up, and I wasn’t disappointed. Being one who doesn’t read manga, and just recently discovered that there is a whole sub-genre of Korean manga, I’m not really in a position to compare or contrast the merits of Priest with its counterparts in manga and manhwa. I can say from an American and European comic book fan’s perspective though that Priest is a work that I found well worth the read. I think that many comic book readers with similar tastes as mine would enjoy it too. 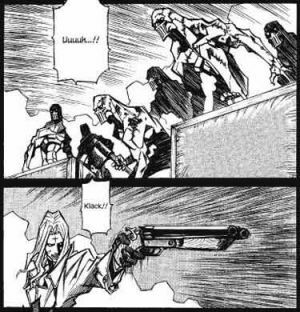 One of the aspects of manga that turns me off from being a fan and therefore reader of it, is the artwork. While manga artwork is a unique and worthy artistic style in its own right, it is a style that simply doesn’t appeal to me. As my readers here at The Bin have probably noticed by now, I’m a fan of highly realistic and detailed art. To me, manga isn’t highly detailed or realistic looking. I’m sure that there are plenty of manga out there that I simply haven’t come across that would fill my personal taste. I just haven’t really looked for them. Priest, while not being intricately detailed or realistic looking for that matter, does remind me of the style of fantasy artwork in the vein of Mike Mignola and others who rely more on atmosphere, fantastic body language, and structure in order to set the tone of their tales. Priest is definitely in this vein as opposed to the cartoonish looking (to me) aspects of mainstream manga. The type of artwork in Priest though does appeal to me (granted a little less than the hyper sci-fi or realistic looking art), and the fact that Priest has a pretty interesting story go along with this type of artwork lead me to want to read more. Ironically, the first two volumes in Priest: Genesis are pretty light on story and heavy on action. The story and intrigue really get started in the third volume, but the three volumes overall come together well enough to leave the reader wanting more. 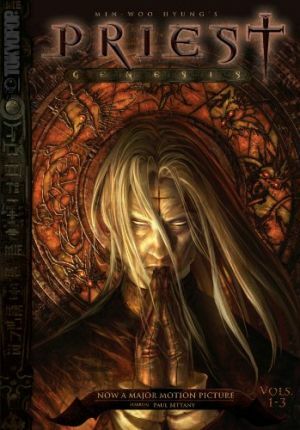 One of the most interesting aspects of Priest as a series is its unique look at Western religious traditions and how it uses them to tell an action/horror tale. Min-Woo Hyung is writing from a sort of outsider’s position about a time period and a religious culture that he is alien to. Granted, I do not know what Hyung’s religious affiliation is, or if he even has one, but his use of Catholic imagery is rather startling and a bit convoluted in its presentation (at least as far as I’ve read in Priest). While one doesn’t have to even really care or be bothered to know anything about Catholic or Christian mythology to enjoy this series, I always find works involving Christian myth-based horror or symbolism to be incredibly fascinating and enriching. Works that portray myths that are aspects of a major belief system or utilize beings that people pray to, worship, and have faith in say a great deal artistically about how actual members of the portrayed religious system view their own beliefs. In the writing of religious horror that utilizes aspects of the Christian mythology, there has been a recent trend towards incorporating as much detail and accuracy to the myths and religious beliefs being portrayed as possible in order to make the horror strike “closer to home,” so to speak, since the audience such works are directed at are most likely practitioners of the religion whose myth is being utilized. Recent works like The Magdalena from Image Comics makes pretty extensive and detailed use of actual religious figures, themes, and imagery. Another recent work from Images Comics titled Drums attempts to pretty accurately capture the symbolism of voodoo based religions of the American South. The first issue of Drums even goes as far to include a short glossary of terms at the end of the issue. Again, this type of hyper detail isn’t needed to enjoy Priest, but the Catholic imagery just doesn’t sit right with the Catholic religion experienced reader. Also again, one doesn’t have to be familiar with all Catholic dogma to enjoy Priest. It’s just interesting to note this aspect of the work in comparison to works by others who grew up in such traditions or have done serious research into such traditions. Perhaps, Hyung is simply not interested in being hyper-detailed in his work, or perhaps he is unfamiliar with the detailed aspects of the religion he’s writing about. Perhaps he’s simply exercising his extensive and excellent imaginative storytelling powers. No matter what the case is, one can’t help but feel after reading Priest that this feeling of incongruity is what a practicing Hindu might feel after watching Indiana Jones and The Temple of Doom or a practicing Buddhist might feel after watching Tomb Raider. Each of these works utilize mythological aspects of each of the aforementioned religions in grossly fantastical and most likely a dogmatically flawed way to tell great stories, much like Hyung does with Catholicism in Priest. 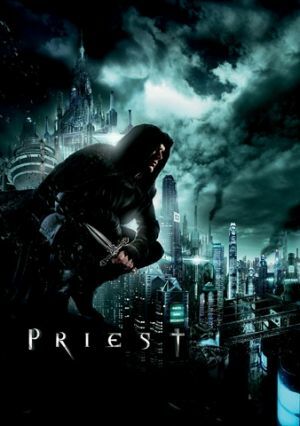 Priest: Genesis is an excellent starting point in the saga of the Min-Woo Hyung’s protagonist. It’s an engaging work that is well paced, intelligent, and action packed enough to leave the reader wanting more. It also is one of those rare works of pop culture that helps its Western reader understand how his or her own culture and religious traditions are viewed by those outside these traditions. For that fact alone, Priest is a near must read. Putting oneself in another’s position of perspective is always enlightening and enriching.